Thank you for joining me as we count down to the MFT release. We are just two short days away from the big day! All the new Stamps, Die-namics, and Stencils will be available on Tuesday, May 2 at 9:00 pm EST. Be sure to check out the MFT Blog to see all the new items being revealed today. Don't forget to leave a comment on the MFT Blog countdown posts, YOU could win one of the five $75.00 gift vouchers. Are you ready for some adorable giraffes? The new Giraffing Me Crazy stamp set and Die-namics is so cute! I stamped the images on X-Press It card and coloured them with Copics. 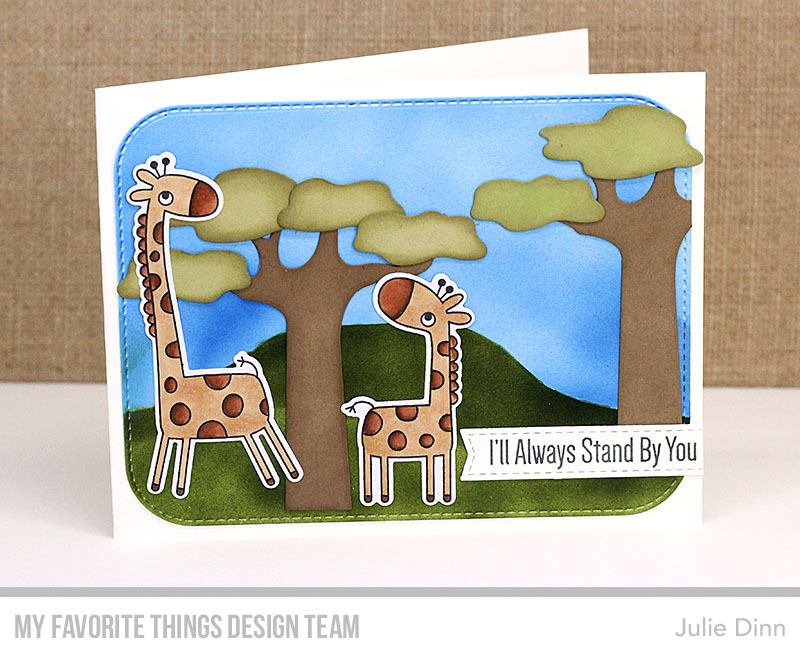 I paired the images with the new Safari Tree Die-namics and the Scenic Safari Die-namics. I love the unique look of the tree. Beautiful setting for the giraffe pair- the coloring is amazing! Cute scene card, Julie. Very nice. Very nice layout and shape of your card! Like how you did the background with rounded corners...cute card. Love your adorable card! The giraffes are wonderful and I'm excited about those trees and other landscape dies! Super adorable card. I love that the grass and sky have such a deep rich color.